Installing a new garage door takes a lot of careful consideration, and the type of door you choose will depend on a multitude of factors. One major consideration should be the opening and closing action the door perform, as there are a few main methods, each with its own distinct advantages and disadvantages. This type of system is one of the oldest ones on the market. It will either consist of one door panel which slides all the way to the side, or two separate panels that each slide to a different side. Since they require virtually no headroom, side sliding doors can be an excellent choice for homes with a crowded or smaller garage. These systems have a very distinctive look, and they require more space and calculations than other types of garage doors. Their fully open position requires additional space outside of your garage, as these systems swing up via overhead hinges that are located on the edges of your opening. This space must be calculated precisely in order to avoid accident or injury. With minimal impact on the ceiling, swing up doors are a good choice if you want to avoid the possibility of messing up anything in that regard. A number of panels, usually wood, metal or fiberglass, will make up this type of door. It requires an automatic garage opener in order to pull it up the tracks to a position where it will roll up like a carpet. These systems provide relatively fast access to the garage and can be a really great choice if space constraint is an issue, or if your garage doesn't have a lot of backroom available. Knowing which type of material is the one that will be the perfect choice for you is important. Wood offers a more classic look and is usually considered to have more "curb appeal". However, it also requires a lot more frequent maintenance in order to keep it from developing rot or warping. Steel is an excellent choice for its security benefit. It is very durable and strong, and won't be damaged easily. However, it could develop rust, and may not be the best choice for more humid areas. As for aluminum, since it is very light in weight, it won't require as strong of an opener as steel and will need virtually no maintenance. However, it can get damaged easily. 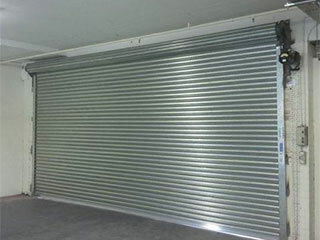 Garage doors can come in all sorts of differnet shapes and sizes, and choosing the right one can become a real hassle. Luckily for you, you don't have to make this decision alone. Our experts at Garage Door Repair Houston can help you make an informed choice, and we'll happily perform the door installation once you've found the perfect one for your home. Call us today to ask our experts for advice. When Should I Replace My Garage Door Opener? Garage door problems must be handled by an expert. Whether its a matter of replacing a broken spring or realigning a door that got off track, the dangers involved in dealing with such a heavy and complex system require the assistance of a professional. Our company has been providing a wide range of services to local homeowners for many years now, and there's no type of issue we can't solve. Check out the rest of our websites to learn more about how we can help you today. Thank you for choosing our company! Feel free to browse our website for more information in the meantime. Our team at Garage Door Repair Houston is at your service any time!